Basically small-town Arco, Idaho in a nutshell. That’s what caught my eye and sparked the photo! Glad you enjoyed, Deb. This is a really wonderful photo. 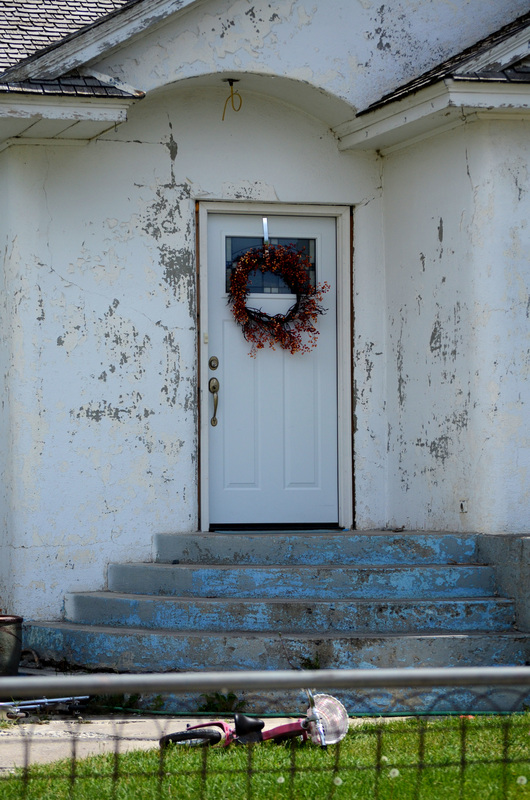 The peeling paint, the colorless wreath, the abandoned bike…wow! I love this shot; beautiful and a little sad at the same time. Makes me want to run over with a can of paint and maybe a decent light fixture to spruce it up a bit. Exactly! It definitely has a bit of a somber vibe to it. Norm, I felt a bit like that, too. This is a striking photo. For once, the door seems to be in better shape than its surroundings. Overall, it’s a little sad though. Thanks so much!! I like it a lot too. It looks like a church. Is it a church door? Nope, it’s just a house on the main drag in a small town, not a church.